Marc Biarnés, PhD; Jordi Monés, MD, PhD. Direct Visualization of a New Choroidal Vessel on Spectral-Domain Optical Coherence Tomography. Ophthalmic Images | March 10, 2016. JAMA Ophthalmol. 2016;134(3):e155017. doi:10.1001/jamaophthalmol.2015.5017. This Ophthalmic Image shows a new choroidal vessel on spectral-domain optical coherence tomography in a man in his 60s. 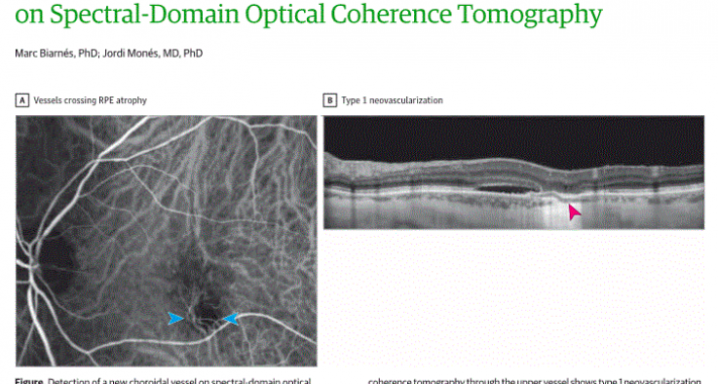 Spectral-domain optical coherence tomography detects choroidal neovascularization by its indirect effects on the retina.1 However, actual subretinal pigment epithelium (RPE) (type 1) or subretinal (type 2)2 new vessels often are not noted.